Prior to the commencement of the works, confirm and establish all reference points and levels. Locate, confirm and protect control points prior to starting the site works. Formworks should support the loads imposed on them by the fresh concrete together with additional stresses imposed by vibrating equipment and by construction traffic. Formwork/Shuttering will be installed as per approved drawings and secured against lateral force by concrete. Formwork thus erected and installed will be rigid, water tight and dimensionally stable. Formworks release agent material as approved by the consultant will be applied prior casting to ensure good surfaced finished of concrete. Before placing concrete, all dirt, debries and other foreign matter shall be removed. Before concrete placing commences, all wedges and other adjusting devices shall be secured against movement during concrete placaing. Before placing concrete, make sure all the reinforcement is ready, cover blocks provided, all MEP installations completed (if any) and all approvals have been taken. The concrete work shall confirm to all requirements of BS 8110, Structural use of concrete. No concrete shall be placed in the permanent works until the consultant has approved the materials. No concrete shall be placed in any part of the permanent structure until the consultant consent has been given in writing. The concrete shall be deposited as nearly as possible in its final position. It shall be placed so as to avoid segregation of concrete and displacement of the reinforcement, other embeded items aor formwork. For the Structures more than 3 meter height, special arrangements will be adopted by providing the openings at top by cutting one top vertical bar (which can be provided on later stage with the “U” shape bars with a suitable overlap) at the distance of 1 meter interval, to accomolate the hose pipe / tremie at the most possible and nearest place of concrete pouring. Maximum free fall height / free drop height shall be minimized to 1.5m to avoid segregation. The layers shall not be placed so that they form featheredges nor shall they be placed on a previous layer that has taken its initial set. In order to comply with this requirement, a layer will be started before completion of the preceeding layer. The vibrators shall be operated at regular intervals to produce dense, compact and homogeneous concrete surface. The size of the vibrating pokers will be decided considering the layout of reinforcements and will ensure consistent mass is obtained without segregation. During concrete placement operations it will be ensured that ambient temperature is ≤ 42°C while concrete temperature ≤ 32°C. The consultant shall be notified in writing before the removal of formwork. No formwork shall be removed until the concrete has gained sufficient strength as specified. The period of time elapsing between the placing of concrete and removal of forms shall be approved by the consultant after consideration of loads likely to be imposed on the concrete. 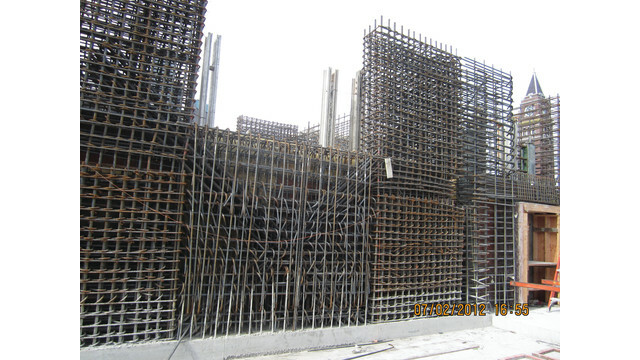 Formwork shall be carefully removed, without shock or disturbance to concrete. As soon as the formwork has been removed, bolt holes in concrete faces, other than construction joints, which are not required for subsequent operations shall be filled. Concrete shall be thoroughly wetted as soon as the forms are first loosened and shall be kept wet during the removal operation and until the curing media is applied. The curing process shall commence as soon as the concrete is hard enough to resist damage from the process. Curing shall be continued for as long as may be necessary to achieve its objectives but in any case for at least seven days or until the concrete is covered by the later construction, whichever is the shorter period.